Special Olympics is an international organization that changes lives by promoting understanding, acceptance and inclusion between people with and without intellectual disabilities. Through year-round sports training and athletic competition and other related programming for more than 2.5 million children and adults with intellectual disabilities in more than 180 countries, Special Olympics has created a model community that celebrates people’s diverse gifts. Founded in 1968 by Eunice Kennedy Shriver, Special Olympics provides people with intellectual disabilities continuing opportunities to realize their potential, develop physical fitness, demonstrate courage and experience joy and friendship. Special Olympics serves nearly 3.5 million persons with intellectual disabilities in more than 200 Programs in more than 170 countries. Through sports training and competition, Special Olympics Nebraska offers continuing opportunities for our athletes to develop physical fitness, demonstrate courage, experience the joy of achievement, and make new friends. To provide year-round sports training and athletic competition in a variety of Olympic-style sports for children and adults with intellectual disabilities, giving them continuing opportunities to develop physical fitness, demonstrate courage, experience joy and participate in a sharing of gifts, skills and friendship with their families, other Special Olympics athletes and the community. 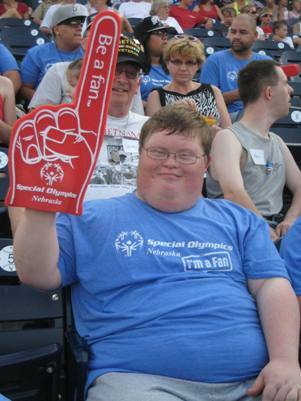 To be eligible to participate in Special Olympics, you must be at least 6 years old and identified by an agency or professional as having one of the following conditions: intellectual disabilities, cognitive delays as measured by formal assessment, or significant learning or vocational problems due to cognitive delay that require or have required specially designed instruction. The Special Olympics Young Athletes™ program was created for children with intellectual disabilities ages 2 through 7. Yes, almost all sports have a Skills component and Adaptive sport component and through Special Olympics Motor Activities Training Program (MATP), developed by physical educators, physical therapists and recreation therapists. MATP emphasizes training and participation rather than competition. In Special Olympics competitions, athletes of all ability levels are encouraged to participate, and every athlete is recognized for his or her performance. Through a process called divisioning, Special Olympics competitions are structured so that athletes compete with other athletes of similar ability in equitable divisions.